Question: "If all sentient beings have the Buddha nature, and as each of them from ancient times to the present must have encountered many Buddhas, why then do they continue revolving in the circle of birth and death and fail to escape from the burning house?" Answer: According to the holy teaching of the Mahāyāna, it is actually because they have been unable to cast aside birth and death through the two excellent teachings that they have not been able to escape from the burning house. What then are these two? One is called the Holy Path [i.e. "The Path of Sages"], and the other is called Birth in the Pure Land. One reason for this is that the Great Holy One's time has now receded far into the distant past. Another is that the principle is profound while understanding is shallow. "In the age of the final Dharma, even if the countless sentient beings should begin to practice and cultivate the way, not a single one of them would attain the goal." We are now in the age of the final Dharma [Jp. "Mappo"], that is, the evil world of the five defilements. The Gateway of the Pure Land is the only one through which we can pass to enlightenment. "If there should be a single sentient being who, even if he should have committed evil deeds throughout his life, recites my name ten times in succession as death draws near and yet fails to be born in my land, then may I not attain enlightenment." If we rely on the Mahāyāna doctrines of attaining enlightenment, then no one has yet contemplated suchness, the true reality, or ultimate emptiness. 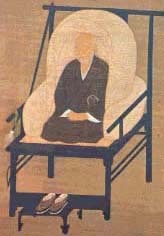 From the Hīnayāna point of view, one must enter into the Path of Insight and the Path of Practice, then one must toil one's way up through the stage of the anāgāmin to that of the Arhat, severing the five bonds of the lower world of desire and leaving behind the five bonds of the higher worlds of form and formlessness. Until now, however, neither monk nor layperson has ever been able to reach these goals. True, there are those who enjoy the benefit of being born as human and heavenly beings. But this benefit is achieved only by having practiced the five precepts and the ten good acts. Now, however, even those who continue to observe these precepts and virtues are very rare. But when we consider people's evil doings and sinful deeds, are they not raging everywhere like the storm's winds and lashing rains? It is because of these things that the many Buddhas, in their immense compassion, urge us to aspire to the Pure Land. For, even though someone has done evil for a lifetime, if only he or she is able to practice the Nenbutsu continually, attentively, and single-mindedly, then all obstacles will spontaneously disappear and he or she will certainly attain birth in the Pure Land. Why, indeed, do we fail to take heed of these things?! And why are we not determined to depart this world for the Pure Land?